We are so grateful for the support and passion of our fans. Please join our quest to help East African children and adults get a head start out of poverty. All funds received will assist The Hall Steps Foundation cause. Both were California high school superstars and All-Americans at Stanford University, where they met. 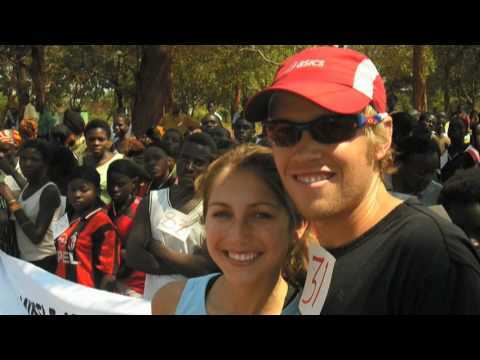 Ryan has posted the best-ever American times in the Half Marathon and Marathon and has represented the USA in the 2008 and 2012 Olympic Games. Sara was the 2012 National Cross Country Champion and a gold medalist at the Panamerican Games in the Steeplechase. She has represented the USA at three World Indoor Track & Field Championships and a World Cross Country Championship. Sara is the creative and spontaneous one with endless energy and keeps things running, including the Hall Steps Foundation. Ryan keeps the house in order, is the best pancake maker, and a bass fishing specialist. They make sure to enjoy plenty of time with their two dogs, Kai and Dash.